Death Talk Project sponsors these regular events: Death Talk Goes to the Movies and PDX Death Cafe. Grief Rites is a monthly literary showcase about all things grief, loss, death and dying. Post 134, 2104 NE Alberta St, Portland. Thursday, October 5, Animal-Assisted Interventions for Grief Support, with Catherine Beckett, LCSW, PhD. This is the Northwest Association for Death Education & Bereavement Support’s quarterly gathering at the 18th Avenue Peace House in Portland, 11:30am-1:30pm. We’re happy to publicize events offered by others in the community in exchange for reciprocal promotion of the Death Talk Project. January 5, 11:30am-1:30pm, It’s Never Too Late: Bereavement Ceremonies Months or Years After Death Occurs. I’m honored to serve as guest presenter for the second time for the quarterly meeting of the NW Association for Death Education & Bereavement Support. All are welcome. Details. March 5, 2017: Celebrate Silas Memorial 5K to benefit the Dougy Center. Online registration opens December 5, 2016. Learn more about Silas and how his mother created a place for the community to come together to honor grief. March 29-April 29: Your Life. Your Death. Your Choices. A Six Event Series organized by the Living/Dying Alliance of Southern Oregon. May 2-June 6: Loss to Legacy: A Story Circle, a six-week class hosted by Spirit of Resh Foundation and WinterSpring in Ashland. Download a flier. May 6-June 3: Understanding Death & Dying: Facing Mortality with Courage and Insight, a four-week class on Saturday mornings with Kris Gould through Portland Underground Graduate School. May 7: LIVE PERFORMANCE OF A FINISHED HEART. A Finished Heart features story, poetry and an original musical score. More info. May 9: A Good Death: A personal blueprint hosted by End of Life Doula Services. Register. May 13: Motherless Mother’s Day Ceremony & Potluck in Portland with Shae Uisna, or create your own using Shae’s guidelines. RSVP. May 13: A Healing Ceremony for Women Who Have Lost Children with Heather Michet & Georgena Eggleston. Register. Download a flier. May 20: Tree of Living & Dying: A Gathering for Sacred Story hosted by Spirit of Resh Foundation in Ashland. Download a flier. May 31-June 4: 7th Annual Death and Afterlife Awareness Conference, coming to Portland with a May 31 kick-off event co-sponsored by the Death Talk Project: The Dilemma of Death & Language of Loss: A Conversation. Use the promotion code “HP” for $10 off general admission to the full conference. June 8, Kindred Hospice presents Deborah Grassman leading a day on Soul Injuries including sessions on Forgiveness, and PTSD and Trauma Integration, and a Caregiver Restoration Ceremony. OHSU in Portland. Download a flyer. June 17-18, Dr. Ingrid Rose presents Living with Dying: Meaningful Encounters at End of Life, a process-oriented workshop wherein participants will explore and learn ways to communicate with those in remote states of consciousness, including the seriously ill, the comatose, and the dying. Dr. Rose has a private therapy practice, is a faculty member at the Process Work Institute in Portland, OR, and for decades has offered Comawork and palliative care training and workshops throughout the world. Northwest Portland. Download a flyer. Sunday, July 23, 2:30pm, An Afternoon with the Threshold Choir, Lewis & Clark College. Grief: A Photography Series is seeking volunteers. A collaboration between Celebrate Silas Memorial 5K founder Jodie Brauer (pictured above in a photo from the series) and photographer Jady Bates. Sunday, August 20, 1-5pm, Journey Through Loss: Exploring Grief and Loss through the Archetype of the Labyrinth, with Anne Richardson, SE Portland. 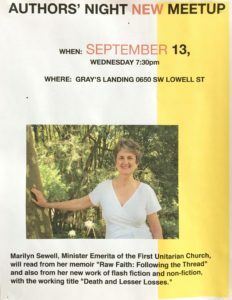 Wednesday, September 13, 7:30pm Marilyn Sewell, Minister Emerita of First Unitarian Church, reads from her new book Death and Lesser Losses at Gray’s Landing, S. Waterfront. Saturday, September 16,1:30-3:30pm, Annual Meeting of the Oregon Memorial ​Association and Funeral Consumers Education Foundation, featuring Gretchen Brauer-Rieke on “The Best Gift You’ll Ever Give – Talking with Your Family”. Rose Villa Performing Arts Center. All are welcome. More info.